Orders within the EU generally arrive next working day if ordered before 5pm GMT. Orders outside of the EU usually arrive within 1 - 2 working days. As one of the UK's leading independent mobile phone retailers with over 14 years' experience in the telecom industry, we bring the best deals to consumers online. We work closely with manufacturers and suppliers to ensure we remain competitive and agile in this competitive market. We have a secure ecommerce platform available on desktop and mobile platforms. As a trusted online store, we will always ensure you get the very best shopping experience. All of our prices are competitively priced and we constantly monitor to market to ensure you get some of the best deals online. We offer all customers dedicated support; before, during and after the order process. You are also covered by our 14 day return policy. Contact us via email or live chat and we will be happy to help you with your questions. Androidcentral.com, Stuff, t3 magazine, daily mail and more. Don't forget that all of our Samsung devices are fully unlocked and sim free for all UK and International customers. You can even switch up your sim or service provider at any time as the handsets will remain unlocked. International and worldwide delivery is generally within 1-2 working days via FedEx, with full 24 month warranty. Don't forget if you're purchasing outside the EU you'll pay the Ex-VAT price. A 10nm mobile processor works with the 6GB RAM to make a rich gaming and app usage experience. 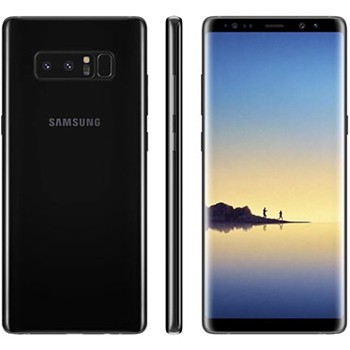 The Galaxy Note8 supports both gigabit LTE and gigabit Wi-Fi, to give you superior connection speed of up to 1 gigabit per second. Iris recognition provides added security to your device. The 3300mAh battery is big enough to keep up with you, and fast charging or wireless charging capabilities, power is on your side. The Galaxy Note 8 houses a sleek 6.3 inch Infinity Display giving you more screen for a bigger view and more space to use the S Pen. And it still fits comfortably in your hand because the symmetric curves and 18.5:9 aspect come together for a narrow body. A fingerprint scanner sits flush on the back of the device, while the Home button is embedded underneath the Infinity Display to stay invisible until you need it. Take notes with the new S Pen without unlocking your device using the Always On Screen, or capture and annotate lengthy emails and documents on the go. Create your own GIFs with the S Pen's Smart select feature to select a section of a video and share them with your friends or on social media. Draw your own emojis or write handwritten messages on photos, whilst live message allows you to express your feelings and send them to people you care about. The Galaxy Note 8's dual cameras have optical image stabilisation (OIS) to produce photos that come out beautifully steady even with camera shake. The Galaxy Note8's wide-angle camera captures more light with its large 1.4µm pixels and bright F1.7 lens, while focusing fast and accurately thanks to the Dual Pixel Sensor. The telephoto camera has 2x optical zoom to let you zoom in clearly, while Live focus lets you take beautiful bokeh shots where you make your subject stand out. This handset is covered by a full 24 month warranty. Huawei P30 Sim Free and Huawei P30 Pro Sim Free: How do they compare? Huawei P30 and P30 Pro Specifications leaked. Could this be the next Galaxy Fold? Samsung hint at wearable Smartphone for your wrists. ULM.COM Ltd is authorised and regulated by the Financial Conduct Authority to provide credit brokering services (FCA FRN: 771678). ULM.COM Ltd works with a panel of lenders to provide these services. ULM.COM Ltd, Forward House, 17 High Street, Henley In Arden, B95 5AA, UK.